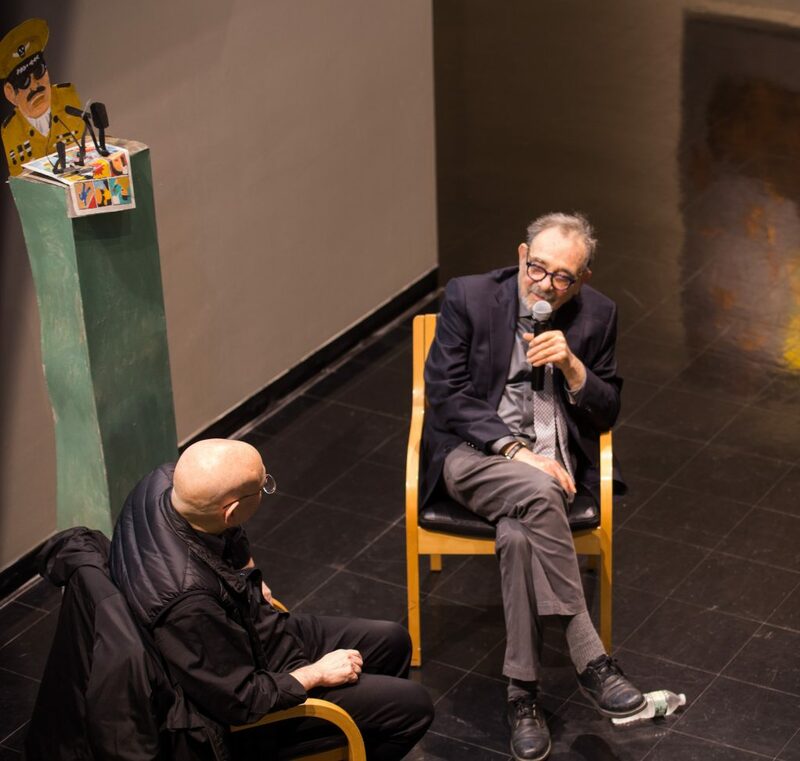 Liat Katz/Contributing Photographer American artist Seymour Chwast discussed his artwork at the BU Art Museum alongside author Steven Heller. A native New Yorker, Chwast became popular in the ’50s and ’60s for his design work on posters, books, advertisements, product packages and more. His distinctly colorful and eclectic art often employs visual puns and humor. At age 87, the artist is as prolific as ever and his BU exhibition solely features work from the past decade. Curator Blazo Kovacevic, art director of the BU Art Museum and an associate professor of art and design, said he chose Chwast with the aim of continuing a new wave of graphic designers being shown at the museum. Two years ago, the museum brought in the work of Milton Glaser, one of Chwast’s co-founders at Push Pin Studios in New York City. After quipping that their usual conversations over lunch were about who ordered the better sandwich, Chwast and Heller discussed everything from Chwast’s choices in subject matter to his sources of inspiration. Chwast said that his paintings, many of which feature patterns of jumbled bodies, machines and cartoonish bursts of fire, are meant to subvert viewers’ expectations. “With the patterns here, the idea is they sort of look like bedspreads or wallpapers, but then when you get up close you find that they’re burning airplanes or parachutes being blown up, so you’re sort of taken aback,” he said. The collection also features several large portraits of soldiers in uniform. When asked about these, Chwast said that he approaches his imaginary subjects with empathy. After the talk, Chwast took questions from the audience. Before the crowd dispersed, an easel was brought to the front of the room, and Heller invited guests to yell out a shape and watch Chwast transform the shape into a simple illustration. He quickly converted a triangle into a turtle, an octagon into Donald Trump and a heart into a whimsical, hog-nosed creature. Kovacevic said he hopes the event will inspire people to not only appreciate drawing, but maybe pick up a pencil themselves. “Another mission here is to teach as many people as possible, regardless of their backgrounds, concentrations, direction or career goals, to draw because I think it enriches the experience of the world,” he said. Bashel Lubarsky, a junior majoring in fine arts, said Chwast’s principles will likely impact the way she approaches her own art as both a painter and designer. Two related events, thematically tied to the subjects of protest art and human rights, will be held in the museum this week. On Thursday, April 11 at 7:30 p.m., the Binghamton University Chamber Singers and Treble Chorus will perform “Choral Commentary: A Program on Themes of Peace and Justice.” The following two days, Friday, April 12 and Saturday, April 13, the University’s Human Rights Institute will hold a conference titled “Technologies of Human Rights Representation: A SUNY Conversation in the Disciplines.” Both events will be free and open to the public.